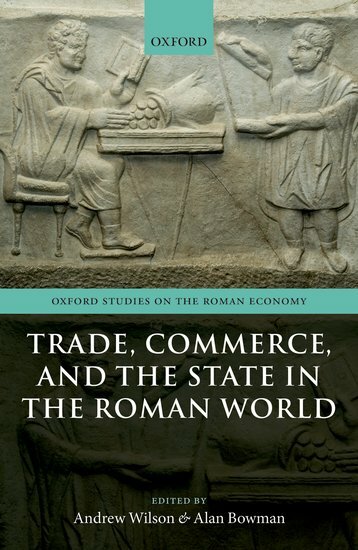 Oxford Studies in the Roman Economy, Oxford University Press. 2017. This volume presents eighteen papers by leading Roman historians and archaeologists discussing trade in the Roman Empire during the period c.100 BC to AD 350. It focuses especially on the role of the Roman state in shaping the institutional framework for trade within and outside the empire, in taxing that trade, and in intervening in the markets to ensure the supply of particular commodities, especially for the city of Rome and for the army. As part of a novel interdisciplinary approach to the subject, the chapters address its myriad facets on the basis of broadly different sources of evidence: historical, papyrological, and archaeological. They are grouped into three sections, covering institutional factors (taxation, legal structures, market regulation, financial institutions); evidence for long-distance trade within the empire in wood, stone, glass, and pottery; and trade beyond the frontiers, with the east (as far as China), India, Arabia, the Red Sea, and the Sahara. Rome's external trade with realms to the east emerges as being of particular significance, but it is in the eastern part of the empire itself where the state appears to have adapted the mechanisms of taxation in collaboration with the elite holders of wealth to support its need for revenue. On the other hand, the price of that collaboration, which was in effect a fiscal partnership, ultimately led in the longer term in slightly different forms in the east and the west to a fundamental change in the political character of the empire. For more information visit the Oxford University Press website.